This section details what's new at our studio and makes transparent our successes and shortcomings when it comes to minimizing our environmental impact. A dynamic partnership in the works at the University of Illinois at Urbana-Champaign aims to prove that paper doesn’t — and perhaps shouldn’t — grow on trees. The participants? 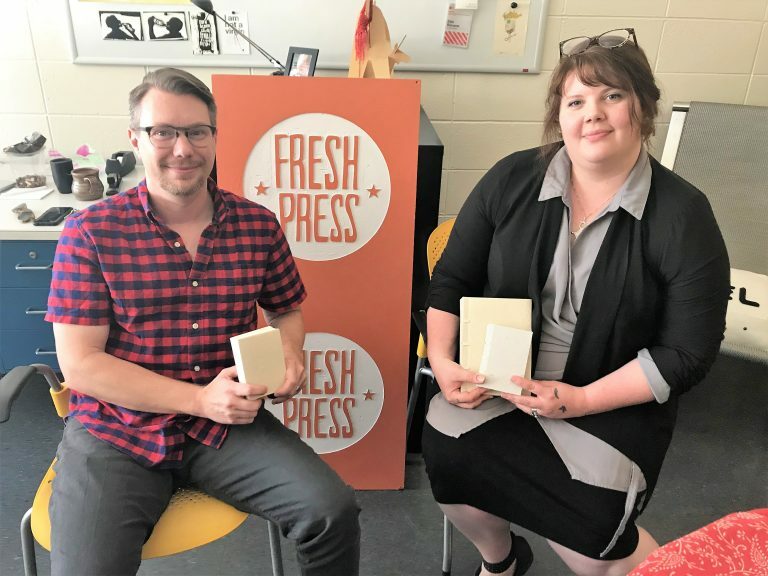 Fresh Press — a hand papermaking studio at the School of Art + Design — and the U of I Library’s Conservation Unit. 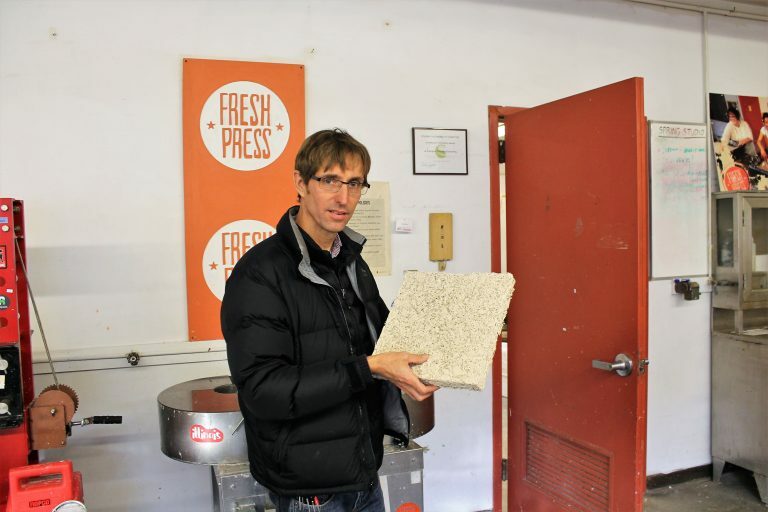 Using Fresh Press’ trademark agriculturally sourced materials, the organizations will collaborate to craft a new kind of paper that meets conservation standards and can be used to rebind and repair the Library’s at-risk relics. Despite existing in separate spheres, the organizations have quickly fallen into step with one another, united by the drive to create meaningful and environmentally conscious material. Fresh Press brings the paper, conservators provide the artifacts, and the result is a multilevel experiment in sustainability, conservation and the fusion of fine art and science. Illinois Professor Mark Taylor holding a brick of CornCrete. Working out of the Fresh Press Studio, Taylor collaborates with Art + Design Professor Eric Benson to explore and experiment with “how agricultural fibers can be used in three dimensions.” These uses occupy a spectrum of scales, from microscopic fiber analyses — to develop strong and long-lasting paper — up to the architectural scale on which Taylor is currently focused: the construction of monolithic walls. This past November/December, we made Speckletone cotton paper for holiday cards created by Lacey Shoman at lefield notes! Welcome our new studio manager, Emma! See her artwork on Instagram! We donated paper to the Delray Beach Historical Society for a kid's summer camp around the theme of the "Art of Writing Letters." Here are some photos of the kids (with permission from their parents!) in the workshop. A new collaborative/interdisciplinary project is underway at the studio! More updates on it soon. New 2018 piece "Drinking Horn" (6x6") on Fresh Press paper by D.R. White. Visit his etsy shop to see more of his work on our paper!